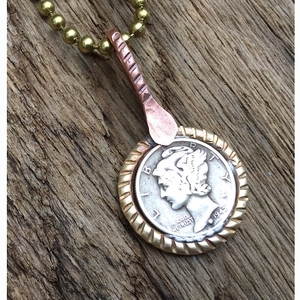 Mercury Dime Necklace, Silver Dime Necklace, Dime and brass bezel necklace, Handmade coin bezel necklace, Brass chain necklace. Old Coin Necklace. Sterling silver mercury dime with hand made brass rope rim on brass beaded chain that can be made any length. Hand made in The USA by The Fun Company.